Cape Coast is a city, fishing port, and the capital of Cape Coast Metropolitan District and Central Region of south Ghana. Cape Coast is situated on its south to the Gulf of Guinea. Cape Coast had a settlement population of 169,894 people (2010 census). The language of the people of Cape Coast is Fante. From the 16th century until Ghanaian independence, the city and fishing port changed hands between the British, the Portuguese, the Swedish, the Danish and the Dutch. It is home to 32 festivals. 1st Top-Left image; Arch bridge and Harbour view from Elmina Castle in Cape Coast • 2nd Bottom-Left image; City hall of Cape Coast • 1st Top-Right image; Shores of Cape Coast • 2nd Bottom-Right image; Balcony of Cape Coast Castle. Location of Cape Coast in Central Region, Ghana. Cape Coast was founded by the people of Oguaa. It is one of the most historical cities in Ghana. Portuguese colonists built a trading fort in the area. In 1650, the Swedes built a lodge that would later become the better known Cape Coast Castle, which is now a World Heritage Site. Most of the modern town expanded around it. The Dutch took it over in 1650 and expanded it in 1652. It was then captured by the British in 1664. Trade was an important motivator in the creation of fortresses and settlements on Cape Coast. Traders from various European countries built these trading lodges, forts and castles along the coast of modern Ghana. Unfortunately, the acquisition of gold, slaves, honey, and the many other goods that composed the African leg of the Triangular Trade was increasingly detrimental to the inhabitants of Cape Coast. 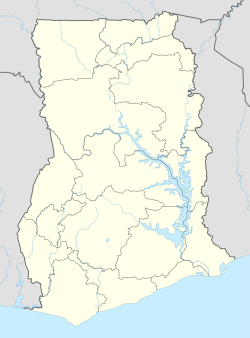 [page needed] In 1874, the British dominated all European presence along the coast of modern-day Ghana using Cape Coast as their base of operations, Gold Coast. With the establishment of formal colonial administration, they relocated to Accra following opposition to the "window tax" in 1877. Accra became their state. Cape Coast Castle was also where most of the slaves were held before their journey on the Middle Passage. The area is dominated by batholith rock and is generally undulating with steep slopes. There are valleys of various streams between the hills, with Kakum being the largest stream. The minor streams end in wetlands, the largest of which drains into the Fosu Lagoon at Bakano. In the northern part of the district, however, the landscape is suitable for the cultivation of various crops. Cape Coast is a humid area with mean monthly relative humidity varying between 85% and 99%. The sea breeze has a moderating effect on the local climate. The crab is the city's mascot and a statue of one stands in the city centre. Fort William, built in 1820, was an active lighthouse from 1835 to the 1970s, while Fort Victoria was built in 1702. Other attractions include a series of Asafo shrines, Cape Coast Centre for National Culture, the Oguaa Fetu Afahye festival (held on the first Saturday of September), and since 1992, the biennial Panafest theatre festival. The city is located 30 km south of Kakum National Park, one of the most diverse and best preserved national parks in West Africa. It is believed that Michelle Obama, US First Lady, considers Cape Coast as her ancestral home, and on 11 July 2009, she took the rest of the first family to tour Cape Coast Castle as part of her husband's trip to Cape Coast. Rev. Dr. Philip Quaque: 1741–1816; first ordained African clergy of the Church of England. King John Aggery Essien: 1809–1899; King of Cape Coast, pioneer Pan-Africanist. Chief James Robert Thompson: 1810-18-86; pioneering educationist. Hon. Francis Chapman Grant: 1823–1889; founding member of the Fanti Confederation; cousin of Ulysses Grant. Hon. Robert Hutchison: 1828–1863; statesman, soldier, philanthropist. Jacob Wilson-Sey alias Kwaa Bonyin: 1832–1902; millionaire, philanthropist, founding member of the Aborigines' Rights Protection Society. Hon. John Sarbah: 1834–1892; educationist, merchant, industrialist. Hon. James Cheetham: 1834–1902; merchant, member of the Legislative Council of the Gold Coast. Rev. Andrew William Parker: 1840–1912; conscientious nationalist, fought in the Ashanti Expedition. Joseph Peter Brown: 1843–1932; patriot, statesman. Prince James Hutton Brew: 1844–1915; solicitor. Thomas Frederic Edward Jones: 1850–1927; petitioned Queen Victoria about Lands Bill. Henry Van Hein: 1858–1928; President of the Aboriginal Rights Protection Society. Rev. Samuel Richard Brew Attoh-Ahuma: 1863–1921; clergyman, nationalist, pioneering Pan-Africanist. John Mensah-Sarbah: 1864–1910; barrister, author, published Fanti Customary Laws. J. E. Casely Hayford: 1866–1930; author, lawyer, politician and educator. Hon. William Ward-Brew, OBE: 1878–1943; lawyer, VP of Aborigines' Rights Protection Society. George Edward Moore: 1879–1950; recipient of the Ashanti Medal, executive member of the Aborigines' Rights Protection Society. Charles Emmanuel Graves: 1884–1929; musicologist, composer. John Coleman de-Graft Johnson: 1884–1956; secretary of Native Affairs, anthropologist. Prophet Jemisimiham Jehu-Appiah: 1892–1948; founder of Musama Disco Christo Church in Africa. William Esuman Gwira Kobina Sekyi: 1892–1956; lawyer, politician, author. Sir James Henley Coussey, KBE: 1895–1958; High Court judge, chairman of the Coussey Commission, president of the West Africa Court of Appeal. Kofi Bentsi-Enchill: 1895–1948; textiles tycoon, philanthropist. Dr. Henry Mercer-Ricketts: 1895–1980; pioneering physician. Margaret Busby OBE, also titled Nana Akua Ackon I: 1944–; Ghanaian-born publisher, editor, writer and broadcaster, resident in the UK. Enstoolment in 1999. Peter Turkson: 1948–; Cardinal-Archbishop of Cape Coast. Kwesi Bekoe Amissah-Arthur:1951–;former Vice-President of the Republic of Ghana. The Fante people of Ghana are notable for their way of cooking. They are known for eating rich cuisine, mostly with more fish, meat, or any form of protein than necessary. It is believed that this is because of the number of rivers and lakes situated in the town. The people are known for their expert fishing and fish preservation abilities. Some of the cuisines are fante fante, etew and pepper sauce or okro stew, fante kenkey, which can be eaten with soups, stews or shito. ^ a b "2010 Population and Housing Census" (PDF). Ghana Statistical Service. ^ Banda, Rajaa. "11 Fascinating things to know about Ghana's Cape Coast". The Culture Trip. Retrieved 19 April 2018. ^ "Cape Coast". Ghana Web. Retrieved 19 April 2018. ^ Rømer, Ludvig Ferdinand; Winsnes, Selena Axelrod (2000). A Reliable Account of the Coast of Guinea (1760). British Academy. ISBN 978-0-19-726218-4. ^ a b "Cape Coast Metropolitan Assembly". centralregion.gov.gh. ^ "Cape Coast Weather Averages". Myweather2. 2013. Retrieved 20 June 2013. ^ "Obamas confront history inside Ghana's slave dungeon". businesstimesafrica.net. Archived from the original on 4 September 2012. Retrieved 16 March 2012. ^ "NANA AMBA EYIABA I". Council of Women Traditional Leaders. Archived from the original on 8 September 2014. Charles Tetty, "Medical Practitioners of African Descent in Colonial Ghana", International Journal of African Historical Studies, Vol. 18, No. 1 (1985), pp. 139–44, Boston University African Studies Center. Gallery of Gold Coast Celebrities 1632–1958, Vol 1 2 & 3; I.S. Ephson, Ghana Publishing Corporation, 1970. Kofi Baku, "Kobina Sekyi of Ghana: An Annotated Bibliography of His Writings", International Journal of African Historical Studies, Vol. 24, No. 2 (1991), pp. 369–81, Boston University African Studies Center. Wikisource has the text of the 1911 Encyclopædia Britannica article Cape Coast.